Skoda Polar SUV To Be Smaller Than Yeti– Duster Competitor? 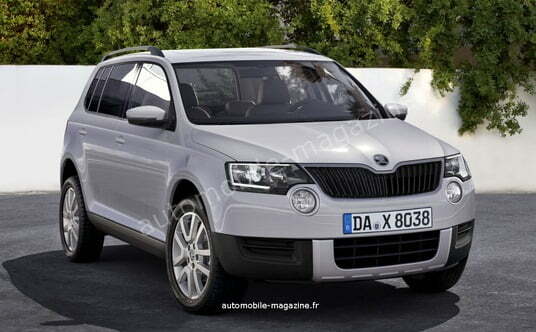 The Czech based car maker, Skoda Auto is planning to bring into the market another compact SUV after the Skoda Yeti. However, this time the difference is that this SUV will be shorter than the Yeti, its wheelbase measuring at 4.1 metres. If we take the recently showcased Volkswagen Taigun, then this SUV will sit in between the Taigun and the Yeti. Called the Polar, it is expected to hit the markets by 2015. It is expected that the Skoda Polar will also be carrying Volkswagen’s MQB platform as its underpinnings. The MQB platform is already underpinned in the Volkswagen Golf and the Audi A3. The Polar will go in competition with the Renault Duster, Nissan Juke and the Peugeot 2008. It is rumoured that the Polar will not be based on the platforms that underpin the Volkswagen Up!, Skoda Citigo, Seat Mii or the next generation Fabia. Currently not many details are available about the Polar. However, the Polar is likely to get front wheel drive architecture and optional all-wheel drive architecture too. The Polar name was recently trademarked by Skoda Auto indicating a high chance of using this name for the SUV. The exterior design is likely to be inspired from the Skoda’s MissionL concept that was showcased by the company at the Frankfurt Motor Show. With the Polar launched, there are chances of increased competition and model cannibalization among the Volkswagen group companies under the companies’ price their products very strategically. Volkswagen recently revealed its upcoming compact SUV, the Taigun at the Brazil auto show. Its underpinnings come from the smaller platform used by the Up! The Taigun measures just 3.86m in length and 1.73m in width. It gets a turbocharged, 1.0 litre engine producing 107bhp and 129lb ft of torque. This SUV just weighs 985 kgs and Volkswagen claims will have a fuel economy of 60.1 mpg. It is to be seen whether this SUV will pose any threat to popular SUVs like Duster and EcoSport which are also quite popular global compact SUVs. We will keep an eye on the developments and will keep you posted, stay tuned to Car Blog India.